Another approach is to categorize R&D efforts based on delivery time frame. Since time frame is continuous, it is useful to divide it into a discrete bins: For example, near-term projects (1-2 years delivery), mid-term projects (3-4 years delivery), and long-term projects (5 years+ delivery). 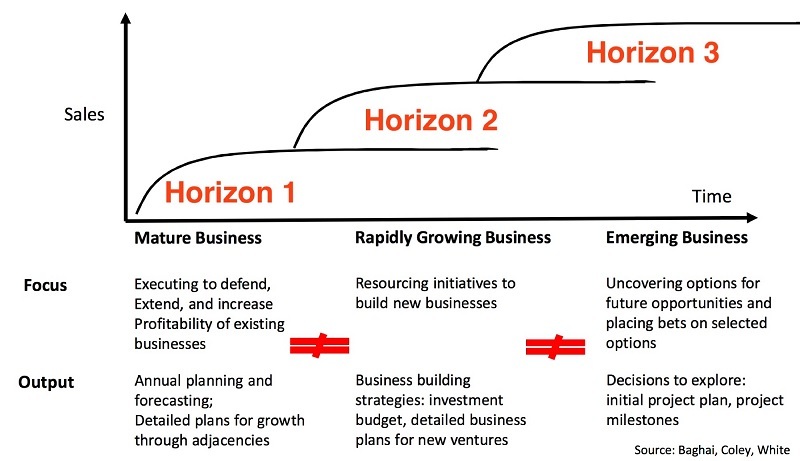 These bins may be different based on development cycles in each organization. Within each delivery time frame, there are different types of projects: Technology Development, Product Development, Manufacturing Process Development etc. Within each type of project, there are different development cycles (long or short). For example, a product-line enhancement project may have a shorter development cycle compared to a product platform development project. Each of these types of projects may be in different stages of their development cycles and may have been started at different times. Hence, R&D management processes need to be flexible to be applicable to all types of projects with varied development cycles. Different types of projects may have different objectives for completion. For example, objectives of a sustaining engineering project improving manufacturability of a product are quite different from a new technology innovation development project. Depending on the objectives, organizations will need to follow different processes to complete projects.